By the summer of 1932 most of the present Birch Cliff Lodge cottages had probably been built and given their somewhat quaint Scottish names, including Bide-a-Wee, Linger Long, Restin Up, Dunworryn and Everest. The lodge was always centered around the dining room. This building, with its distinctive vertical glazing bars on the upper half of the windows, was originally William Mulcahey’s home, built about 1917, at the time he sold “Grant’s Store” to Hiram and Elizabeth Grant. Mulcahey was the founder of Baptiste Village and owned all the land of the present Village. Today the lovely dining room is used for special occasions such as weddings and conferences and our annual thanksgiving dinner which is open to the public. In the summer we also have a weekly pot luck dinner with our guests. Birch Cliff thrived under the direction of the founders, Art and Edyth Nicoll with most guests coming from Ohio, Pennsylvania and New Jersey, along with a smaller number from Ontario and Quebec (the President of Bell Telephone in Montreal was a frequent visitor). The main attraction was, of course, fishing, but the pollen-free air, in the days before allergy shots and ‘puffers’, was also an important inducement for guests. A large fleet of flat-bottom wooden boats, painted white with green trim and powered by 5 hp outboard motors, took guests fishing. The usual pattern was to go with a guide, take a shore lunch and spend the day on the lake. 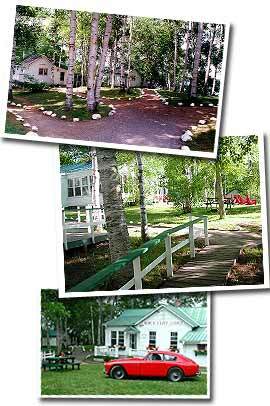 Today, outwardly, Birch Cliff Lodge has been restored to its original 1930s to 1950s appearance. Inside the cottagers, however, everything has changed; complete modern kitchens and bathrooms with lots of hot water; enlarged bedrooms and sitting areas; screened porches and open decks; comfortable seating and comfortable beds combine to provide 21st century vacationers with the comforts they are used to.